As one of the most desirable neighborhoods in Colorado Springs, the Broadmoor area boasts many sub-areas are that offer an array of housing properties for home buyers looking for a home above the 400K price range. 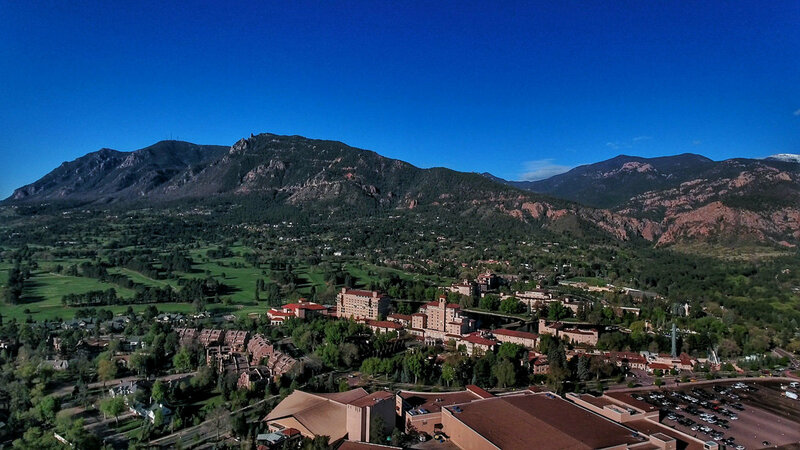 The Broadmoor hotel and all of its amenities, incredible access to wild spaces, an array of great local restaurants and easy access to shopping make no surprise that this one of the most desirable neighborhoods in Colorado Springs. The following is a guide to the different sub-neighborhoods that exist in the greater Broadmoor area. The area surrounding the Broadmoor Hotel is considered Broadmoor Proper. These properties are some of the most sought-after properties in the country. The Broadmoor Hotel is one of two 5-star hotels in all of Colorado which significantly influences home values in the area. Homes of similar size and amenities are significantly higher priced the closer you get to the Broadmoor Hotel. This is true for a number of reasons. One reason is that people like Spencer Penrose, who was a pioneer of Colorado Springs and built the Broadmoor Hotel, also built some of the first homes in the area. Another is simply because the Broadmoor is a luxurious landmark attracting visitors from the world over so it is quite the privilege to live in Broadmoor Proper. Broadmoor Bluff Estates is a community south of the Broadmoor that is bordered by Broadmoor Bluffs drive on the South, Highway 115 to the East, Star Ranch Road on the North and Farthing Dr and Neal Ranch Road to the West. Cheyenne Mountain Elementary is a top rated school that is situated in this area. Over the years the home values have steadily increased in this area and there are a plethora of land parcels for sale making it a great place to build your dream home with incredible views of Cheyenne Mountain, Downtown Colorado Springs and Colorado's eastern plains as well. Broadmoor Downs is a great area that is situated East of Highway 115 and West of Broadmoor Bluffs Dr. This quaint and quiet area is a great family oriented neighborhood with mostly single-family homes. The area is very close to the shopping across 115 where a King Soopers resides as well as a Safeway on the South end of Broadmoor Downs. Broadmoor downs have many quiet streets with very little traffic and most of the area features low-traffic culdesacs which make for a super family friendly and quaint feel. Broadmoor Glen South is the furthest South and East portion of the Broadmoor area. Top-rated Pinon Valley Elementary is situated in the middle of this community. Broadmoor Glen South is a great community with mostly single-family homes and is in close proximity to Cheyenne Mountain State Park as well as Fort Carson. This area is a great place to live if you are stationed at Fort Carson and even if you work in Downtown Colorado Springs the drive is only about 10 or 15 minutes away. The area to the west of Broadmoor Valley Rd is considered to be Broadmoor Hills Park. This area yields great views of both Downtown Colorado Springs and Cheyenne Mountain. Situated dead smack in-between Cheyenne Mountain Elementary and Broadmoor Elementary, children in this area attend Broadmoor Elementary. The area has incredible access to The Country Club of Colorado and the Cheyenne Mountain Conference Resort. Broadmoor Bluffs is the area South of Star Ranch Road and features many amenities such as close proximity to shopping and incredible views of Cheyenne Mountain, Pikes Peak (from the right angle) and Downtown Colorado Springs. The area boasts a wide array of mid-size to larger single-family homes set in picturesque surroundings. Broadmoor Heights is the area close above the Broadmoor proper areas. The divider is the Broadmoor Golf Course. This area is an incredible area for those who love to wake up early and watch the sunrise to the East. This area has incredible views to the East and North up the Front Range Rocky Mountains. The area is also very close to many amenities such as the Cheyenne Mountain Zoo and North Cheyenne Cañon Park. Broadmoor Mesa is the area south of Lake Ave, North of Broadmoor Valley Rd, East of Marland and Old Broadmoor Rd. This area includes all the "Spring" streets such as Springmeadow Dr., Spring Grove, Spring Lake, and Springridge Dr. The homes for sale in the Broadmoor Mesa area in Colorado Springs include mostly single-family homes between 400 and 800K. This area is very close to the many amenities available at the Cheyenne Mountain Conference Resort and the Country Club of Colorado. Broadmoor Ridge is the area in close proximity to Cheyenne Mountain Conference Resort and Country Club of Colorado. This area is a great place to raise a family as it is close to Broadmoor Valley Park which is a great city park in the Broadmoor neighborhood. The Broadmoor Ridge area runs along the rim of Broadmoor Valley road as it reaches Broadmoor Mesa.